For more Volunteer FAQs, scroll down! Before you get (egg) crackin’, you’ll have to complete and pass our online orientation for food safety and all that fun stuff. Click below to get started! Volunteers are responsible for delivering the cake to the agency so please choose one close to you. Get ready — You’re about to make someone’s whole year! See all of our cakes! 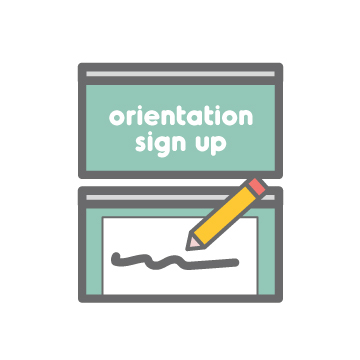 1 • Pre-Orientation FAQs - I have some questions before starting! 3 • Post-Orientation - You’re an active volunteer and you have questions! • • • • • Where are you located? We’re in a lot of places! Check out our Chapter List to see all the states and counties we’re open in, and going to open in as well - yours might be next! If you’d like your city to be considered, submit for consideration. If you’d like to open a chapter yourself, take a look at our requirements and see if you’d be a good fit! • • • • • Can our group bake a cake for an event? We’re more of a one-on-one org, otherwise there are just too many cooks in the kitchen! Each cake is special, and we’d like volunteers to keep it that way. Plus, all baking is done in the volunteer’s own kitchen, and cakes are requested as they’re needed — so we can’t facilitate a corporate/group event. • • • • • Is there a requirement to how many times I need to bake? • • • • • Is there an age minimum to bake? Can my child bake with me? You, our volunteer, must be at least 18 years old. If you’re under 18, your parent must be the volunteer in good standing. We love our little bakers, we just ask that they are supervised with an adult (the volunteer in good standing) at all times to prevent any accidents. This is for liability/insurance issues. • • • • • How will I know who to bake for? You’ll learn during orientation about our Task Calendar that has all the cake requests and details (date, type, age, theme/colors, delivery address, timing window) before you get to choose the one that fits you and your schedule. Sometimes we have non-specific cake requests that allow our bakers to get truly creative, but rest assured you’ll still be given all the information you need about delivery date, address, timing, and contact information for the agency. • • • • • Do I have to take the orientation? What if I have a ServSafe Food Handler’s License already? Yes! In order to become a volunteer, you must take the online orientation - this is non-negotiable. The orientation has two parts: How We Work and Food Safety. If you have a Food Handler’s License, the Food Safety quiz should be a breeze, and you’ll get to learn how we work! • • • • • Can I receive community service credit for baking? Yes! Each cake is worth three (3) hours of community service credit. We cannot sign off for cakes that you have not yet delivered (even if you signed up for them), and you cannot sign up for multiples cakes in one day to check off your community service hours. Otherwise, we’re more than happy to accommodate a sign off - you should be recognized for the good you do in your community! Reach out to your Chapter Leader and they can help with the paperwork. • • • • • Can I post the cake on Instagram/Facebook/Twitter? • • • • • How creative can I get? If Picasso, Jackson Pollock, and three identical unicorns all decorated the same cake, what do you think it would look like? We totally understand! Follow us on Instagram or Facebook for updates. Reach out and join whenever you’re ready for a fun afternoon of good feels. • • • • • Can I get a picture of the party? Unfortunately, we legally cannot take videos or photos of the cake’s recipients except in super rare circumstances. But rest assured, your cake was thoroughly enjoyed! • • • • • The link for Key Takeaways is not working (Lesson 10) and I can’t advance any further! We don’t know what causes this, but it is a known issue so don’t worry - we’re working on a fix! We’ve found that volunteers have gone around this bug to the next part of the course by clicking a lot to get through…and then it lets them. We don’t know why this happens, or why it works, but sometimes it does. If it doesn’t, email us at support@forgoodnesscakes.org and let us know your issue. • • • • • My volunteer registration is not found even though I passed the orientation? If you exit out of the course too quickly, or don’t watch the video all the way through (we mean until the very end, when there is 0:00 left to play), then sometimes a registration gets stuck. Send us an email at support@forgoodnesscakes.org and let us know your issue and we’ll try to get it handled as soon as we can! 3. Flavor(s) requested MUST be met, zero exceptions. Decorating request is less strict - do the best you can! • • • • • The task calendar is empty/doesn’t have any cakes in my area! What does that mean? If the Task Calendar is empty, it just means all the cakes that have been requested are signed up for. Check the link in a few days, as our agencies are always adding more requests. (2) an agency nearby doesn’t request as many cakes as another one in an area farther away from you - so you may have to check back more often to catch a cake before someone else does! • • • • • I am sick/family emergency/something came up and I can’t bake - can I buy one? If you’re sick, we prefer you don’t bake AND go near others to deliver something, even a store-bought cake. The agencies you deliver to need to stay healthy, too. Let us know ASAP if you’re sick. If you have an emergency, let your Chapter Leader know ASAP - but you can purchase a cake instead, provided it meets the requirements we discussed in the orientation. It must say Happy Birthday [name], must match the flavor the recipient requested, and be as close to the request as possible (i.e., favorite color/theme shows up on the cake somehow). • • • • • I can bake but I can’t deliver OR something came up and I can’t deliver the cake - can someone else? Yes! Someone else may deliver the cake for you, on the condition that they have an active driver’s license and active proof of insurance. You can also hire a Task Rabbit to pickup and deliver your cake for you - we have a code that gives you $10 off! • • • • • I’m a terrible decorator - can I still volunteer? Of course! No one ever started out piping perfect flowers, everything is practiced. Let us help you practice by baking some cakes for some deserving children. All we ask is that you use a recipe you’re familiar with (i.e., taste tested and confirmed delicious), or a box/can of frosting. Check out some of these awesome YouTube videos for basic decorating techniques! Cake by Courtney: lots of great tips on decorating! • • • • • Do you have any links to good recipes for cakes and/or frosting? We’re glad you asked! If you’re not familiar with baking cakes from scratch, we highly encourage using box mix and canned frosting. Baking is a science, and cakes are no exception. Ask our Executive Director some time about the 10 years of red velvet cake recipes she had a disastrous time with before FINALLY finding a good one (seriously - it took 10 years). One more thing: we love our fellow chefs, but please know that cookbooks don’t always taste how you’ve experienced the recipes if you have gone to their restaurant/bakery. There are a lot of reasons behind this: food made in large volumes are always measured a bit differently, you may be using other brands (and yes, some brands are more suited for the recipe than others), and chefs have years of experience and commercial equipment. We highly encourage you to test, test, test all recipes, learn from mistakes/failures, and be mindful about the season. Humidity/heat/cold in your kitchen affect more than you know! • • • • • How can I tag you on social media? What am I allowed to post? You are allowed to post the cake itself in all it’s beautiful glory - but please don’t give away the name of the agency it’s going to. First name and age of the recipient is okay to show! • • • • • There aren’t ever any cakes in my area - the ones you have are too far away! (1) You live in a higher income area: nonprofits who help underserved youth/young adults cannot pay for the higher rents the way for-profit businesses can (because majority of revenues need to go toward the program! ), and the number of building owners willing to donate space drop dramatically the higher the rents they can fetch, so there may be one or two agencies who work with the city for subsidized rent. Overwhelmingly, though, agencies are located in areas that suit their budgets. This may be a bit farther away. (2) The agencies that are in your area may request a smaller number of cakes a month, so you have to be more vigilant about checking the calendar. Agencies are reminded around the end of the month (20th - 24th) to submit their cake requests for the next month, so check around then! (3) There aren’t enough volunteers in your area. This is where you can help - post about your experience on social media and help us find more volunteers! They can take our online orientation and join our Sprinkle Squad quickly, and we’ll notice where there’s an uptick. • • • • • I know a nonprofit that For Goodness Cakes should work with! Awesome! Send them this link and let them know to fill out the form, and the Chapter Leader will get in touch! We can help! Find your Chapter Leader, send them an email, and they can help give you the information you need. • • • • • Do I need to include candles? Nope! Candles are nice, but what we and the recipients appreciate the most is that you made the effort to bake them a cake in the first place! • • • • • Do you have a delivery person for a cake I’ve baked? We do not - but Task Rabbit does! Here’s a first time user coupon if you need it! • • • • • What does optional mean on the cake request (under frosting/filling/etc)? Optional means it’s up to you. If they put their favorite flavor is vanilla, but they don’t have any dislikes/favorites for filling/frosting, use your best judgement. If it says N/A it just means the recipient doesn’t have a preference, so you can put whatever you think will taste best. Unless the request specifically states that they don’t want filling/frosting, always assume to put filling/frosting. • • • • • What does non-descript mean? Is it still for a birthday? Yes! Unless it specifically states that this is for a graduation, this is always for a birthday. Non-Descript means you can make the cake however you’d like. Choose the flavor, frosting, design, piping, color, theme - whatever! Get creative! Just make sure to put Happy Birthday somewhere on the cake. • • • • • Where can I connect with other volunteers? Great question! Come join our Facebook Group, ONLY for registered, active Sprinkle Squad members! • • • • • Can I deliver the cake the day before? We don't endorse this, but if you absolutely must, then that is a question you need to ask the agency. Call or email the contact person in the request and ask if you can - but please don’t make this a regular habit. Only do so if there is an emergency or you absolutely cannot move a previous engagement. We will be notified if this becomes a regular habit and it will incur an investigation with a possible suspension. • • • • • What if I have a problem with the delivery, who do I call? There should be a contact name and number on the request. If you are having an issue and cannot get a hold of them, leave a voicemail and get in touch with your Chapter Leader. We advise agency staff to give phone numbers to people who will pick up the phone - not to a reception desk which may be unattended during your delivery time.